I am German, and therefore hardwired to like pretzels. Everybody knows that in Bavaria babies are basically born with a pretzel in their hand. But even up north, where I come from, they are one of the highlights in any bakery. You can always find them on the top of the counter, dangling seductively on their little wooden stand, just out of reach for little hands. Pretzel benefits: They are easy to hold. The perfect mixture of chewy and crunchy. Kind of fun because of their shape and just a great snack. But. Not low carb, friends! My low carb grain free pretzel mission started about a year ago when I attempted to make a low carb version with almond and coconut flour. The result looked quite cute and tasted nice and crumbly, but…well, it was just not the soft, chewy taste experience I was after. It was simply a cookie in pretzel form. Now, it’s time to throw pizza crust into the mix. The pizza problem – how to replace the doughy, crunchy wheat crust with something low carb – has been solved successfully with fat head pizza. I have traced the recipe as far back as I could. The first mention I found is here on cookyscreations, in June 2012. The idea was then re-named and made famous by the guys from the Fat Head Movie – see here. Fat head pizza dough tastes deliciously doughy and is a more than decent alternative to pizza. The only drawback is perhaps that it is incredibly filling. It is therefore almost impossible to eat a whole pizza. Fathead dough makes the most delicious Keto pretzels! This post is a revamp of an older recipe – I decided to improve on the recipe and take new pictures at the same time. In my original version I used only very little almond flour and also added flaxseed (I had a serious flaxseed phase then and felt the need to add it to almost anything). This time I decided to go back to the roots. Since my first round of grain free pretzels I have made the most delicious keto cinnamon rolls using the original Fat Head dough. They are the BOMB – chewy, tasty and just the right side of sweet, topped with a cream cheese frosting. 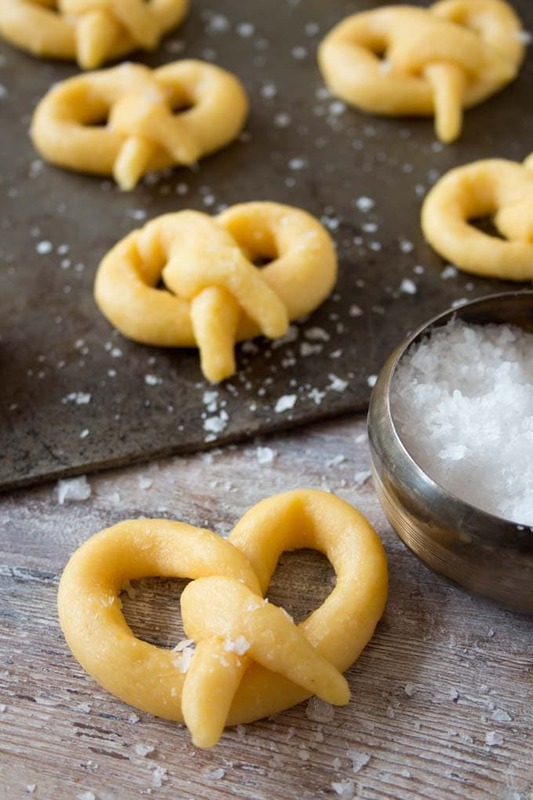 Inspired by them, I knew I had to go back and tinker with this pretzel recipe. This time I used ground almonds (this is what we call coarser almond flour or almond meal in the UK) instead of super-fine almond flour. It works just as well – just add 2 extra tbsp to make sure your Keto pretzels don’t flatten out in the oven. 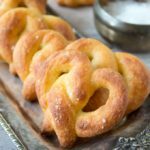 I really hope you try these low carb pretzels with my adapted Fat Head dough! The dough is just as tasty and fluffy as the one I made for my cinnamon rolls. Just check out the picture above. Doesn’t it look so good you want to take another bite? Note to self: Make a double portion next time. 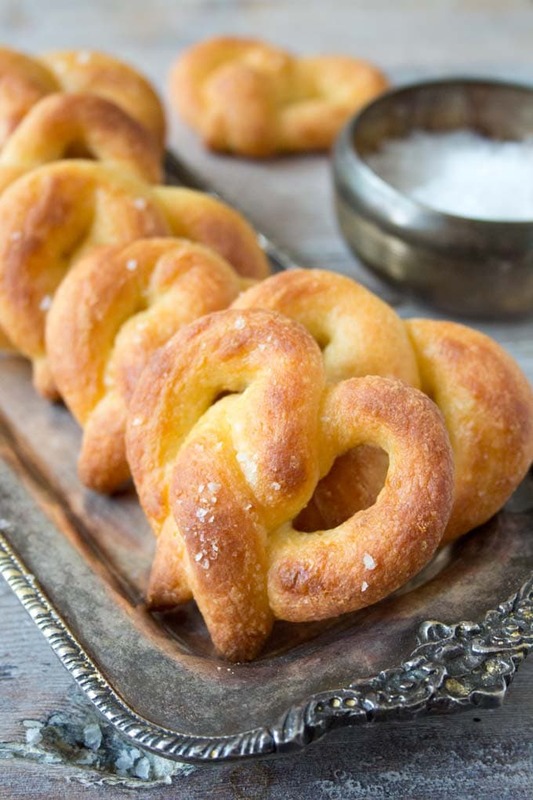 Chewy, soft Keto pretzels that taste just as good as the real thing - only without the carb load! 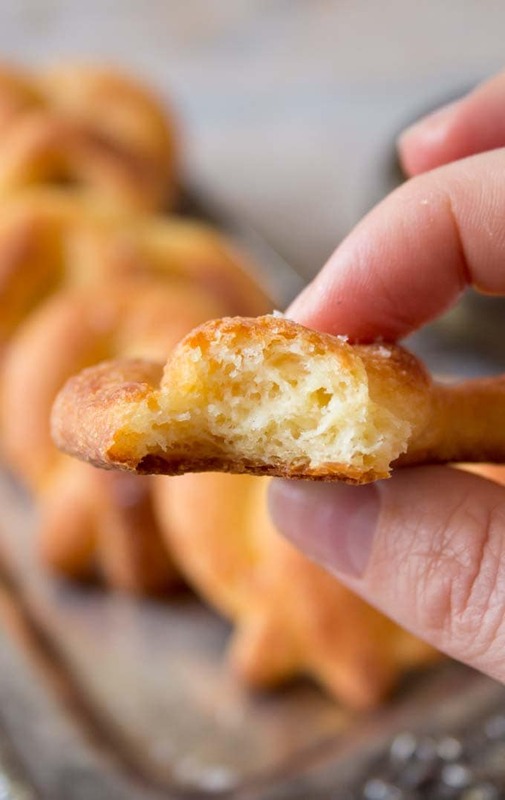 These pretzels are made with mozzarella dough, which is an absolute game-changer in low carb baking. Heat the oven to 180 degrees Celsius / 356 Fahrenheit. Melt the mozzarella and the cream cheese. I did this in a pan on a very low heat, stirring constantly once the melting process starts. If you have a microwave, 1 minute should do the trick. If you do this on the stove, turn off the heat once the cheese is fully melted. Add the egg to the warm dough and stir until combined. If your egg is straight from the fridge, you might have to heat the mixture gently. Add the ground almonds/almond flour and baking powder and stir until combined. You should end up with a big mozzarella ball that looks just like dough. Pinch off a piece of dough (ca 30g) and stretch/roll it in your hands until it is about 20 cm long. If the dough is too sticky, you can try oiling your hands. 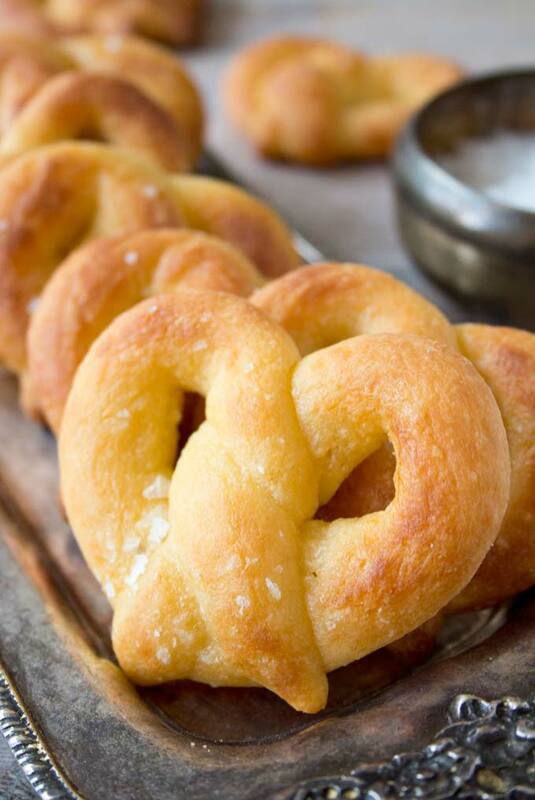 Form it into a pretzel shape and place on a baking sheet. My dough made 10 pretzels. Sprinkle with sea salt and bake for circa 17 minutes or until nicely browned. You might want to rotate the baking sheet half way through. This recipe works with almond flour just as well as with ground almonds. The choice is yours! The dough needs to be warm when you handle it. The mozzarella should not be bubbling - you need to be able to touch it with your hands without burning yourself. When it's too cold to work with, just heat it gently. The pretzels taste best straight out of the oven. If you have leftovers, store them in an airtight container. Could I add some chopped jalapeño to this recipe? They look great! Yes, a bit of spice would give them a nice kick! Carbs counts are unclear. Is the two part of a 24? Clarify please? If 24 NOT low carb? Hello Anne, the table states the total carbs as 2.4g, not 24g. Hi, Are the nutrition facts for one pretzel? Thanks. Thanks for sharing. My first attempt was a bit too wet, so I decided to make small flatbreads. Amazing, cut them open put in some Philadelphia and a slice of salami… very delicious. Amazing recipe. I LOVED these pretzels. Soft and pillowy. These are truly GENIUS! I got 9 and they kept the shape and are just delicious 🙂 I did have to oil my hands just a tiny bit with avocado oil but other than that – easy peasy! Thanks for the recipe!!! Any chance of you posting the original recipe? Oh Rob. I actually don’t have it any more! I used 1 tbsp of flaxseed and less of the almond flour, it might have been half the amount, actually. 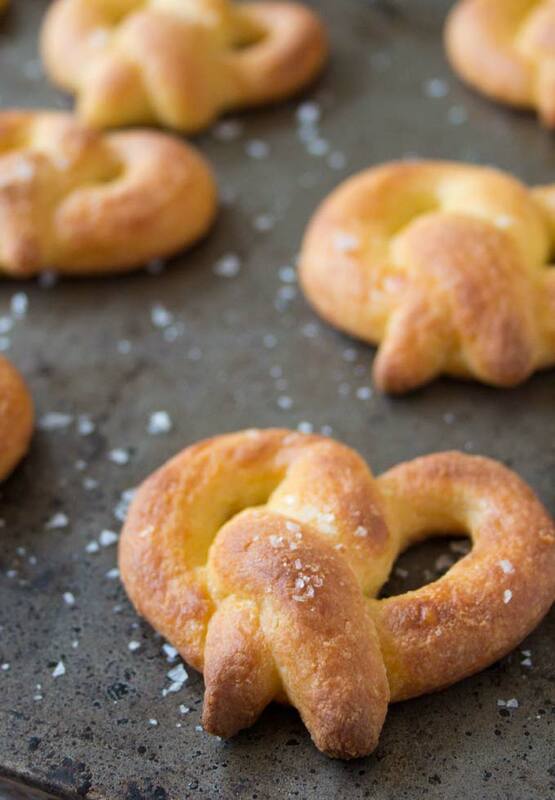 This new recipe helps the pretzels hold their shape better. I LOVE these pretzels. The dough is a bit messy, but well worth the effort! The fat head dough does take a bit of getting used to. Glad you enjoyed the pretzels! Your blog is so nice. I’m on keto diet for a month and can’t find many blogs in the UK that would support my “journey”. Your receipes look lovely and they don’t repeat with other blogs at all. What a lovely message! Thank you for your support and I’m glad you’re liking the recipes. Keep on checking in! Wow these look brilliant! Can’t wait to try! Has anyone been successful with an egg replacer? I was going to try one flax egg (one tbsp flax meal and 3 tbsp water) in place of the egg. Thank you for sharing! Hi Grace I haven’t tried that but you should just give it a go – I think it could work. My old recipe version had flax in it, which worked well. And the mozzarella will also help to keep the dough together – no need to worry that it might get too crumbly there. I am German too and love pretzels. So glad I found this recipe. Vielen Dank! These pretzels are delicious! Great recipe update. I liked the old recipe, but the new one is AMAZING. Thanks Katrin! Oh, that’s so good to hear. Thanks for your feedback! Wow. Cannot wait to try this. I have some ground almonds, just have to get the mozzarella. Thanks for the inspo! Brilliant. Keep me posted on how you like them when you get around to trying our the recipe! I have made your old recipe and really liked it. Now trying this version – they just wen in the oven and I have to say, they look sooooo good!!! Katrin, this new version looks just incredible! I love Fat Head dough. Use it all the time. It’s just ingenious, right???? A bit difficult to handle, but worth the effort. Brilliant recipe. I’ve made these quite a few times now and they always come out beautifully. I made these several months ago after seeing the recipe on Pinterest, and absolutely loved them! I’m not sure why I waited this long to make it again, actually! I don’t know what the difference is this time, but no matter how much oil I put on my hands, I can’t roll it even into a ball, let alone a rope! I live in humid eastern PA, but today is a beautiful, cooler day, so I don’t know if humidity is making the difference? I added an extra Tbsp of almond flour, but still no luck. I currently have the dough in the fridge to see if that will help. Any suggestions? Hi Stacey, how annoying! I really wish I could help. The dough is not the easiest to handle, though it is best if it is warm (the dough, not the weather :)). Hopefully it is willing to be formed into pretzels once you get back to it. After all, it worked out for you before! What is balsamic reduction and how does one make it? I made these. They didn’t keep their pretzel shape but they were delicious! I reheated them the next day with goat cheese and then did a balsamic reduction drizzle. What perfect “pub” food! Thanks so much for the recipe. Arlene! That’s so good to hear. It’s all about the taste, I wouldn’t worry about the shape too much 🙂 The combo of goat cheese and balsamic reduction sounds so yummy. What a great idea! Hi Betsy, exactly. 180 Celsius, 350 Fahrenheit. Oh Wow!!! Thanks for clarifying that, Betsy! I would have set my oven at 180!!!! Wow! I love the simple ingredients list – got to try these! I love mozzarella dough. It is so versatile! These look great. Mozzarella dough is amazing. So many more things I want to try with it! So do if you buy the mozzarella already shredded? Or do you buy like a big piece of it and partially freeze it and then shred it? I’m very new to Keyo. Hi Claira, I just buy the pre-shredded mozzarella. I’d never eat it on its own, but for Fathead dough it’s the best option. The good stuff (the lovely moist mozzarella you’d use in a salad) contains too much water. Wow. What a great idea. These look great, Katrin. These look delicious! Would be a treat to find the larger course salt to top them with. Maybe even dip them in some spicy cheese! These look absolutely divine! Cant wait to give them a go!